Includes the Large Venezia Journal and the Stream Pen with Stylus. 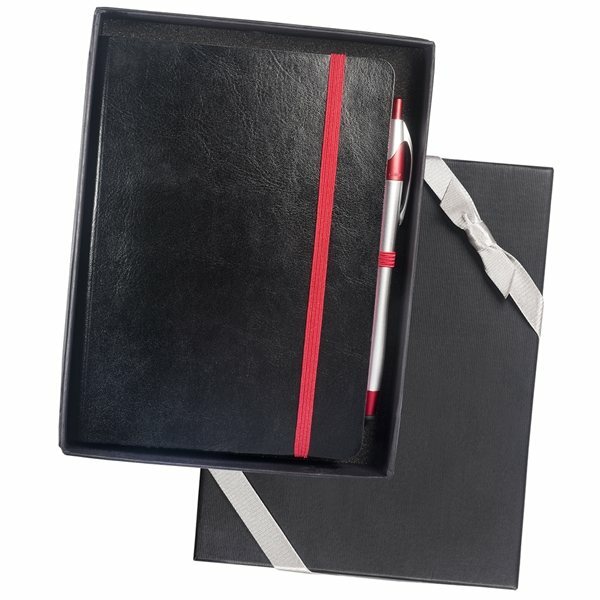 Journal features soft faux leather cover with matching colored edges, bookmark, pen loop and elastic loop closure with 96 ruled pages and document pocket on inside back cover. ABS plastic click-action ballpoint pen with soft silicone tip for use with touchscreen devices and slim ergonomic design with curved clip. Everyone loved this give-away item. Nice quality and printing. the artwork is always fantastic. they look great! Thanks so much! We have other products we are buying from AnyPromo that are bigger, better and within our budget and are nice and good quality. Excellent- love the color. Very professional. Very affordable cost as well as top quality... will certainly order with this company again!!! it actually looks better in person than online.